Ana Mardoll's Ramblings: Fat Acceptance: Plan Your Fat Hating Holiday Today! Fat Acceptance: Plan Your Fat Hating Holiday Today! 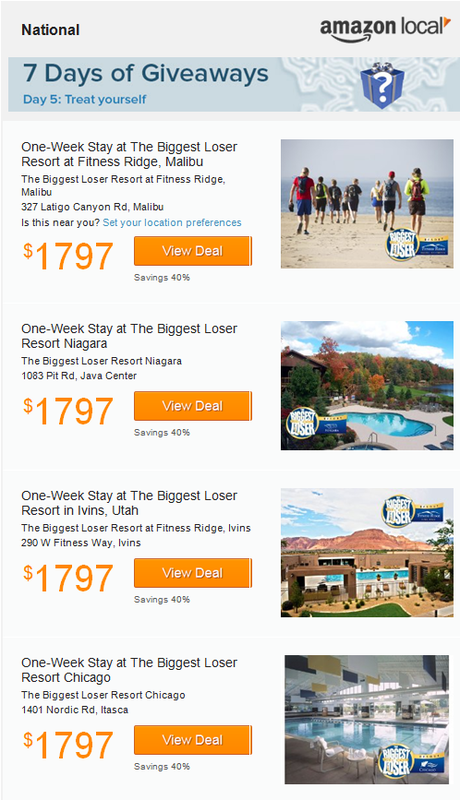 It's a "deal" notice for four different 1-week stays at "The Biggest Loser Resort" in Malibu, Niagara, Utah, and Chicago. All four stays are available for approximately $1,800 dollars, and the advertisement claims that this is a 40% savings from the usual price. And just to make things very clear to everyone, two of the locations are further named Fitness Ridge (Malibu) and Fitness Way (Utah). There are times, like when I was writing this post earlier in the year, when I wonder why The Biggest Loser even exists. Are there really that many people who want to watch the terrible, truly terrible*, treatment of fat people on this show? And the existence of these "resorts" seems to indicate that there are not only people willing to watch this show, but that there are people willing to pay extremely good money to go to a place where they hope to be treated similarly -- or, more chillingly to me, where they hope the fat spouse / relative / friend they've brought with them to the resort will be treated similarly. This is what breaks my heart about fat hatred in our society: that spending huge sums of money in the hopes of escaping the widespread prejudice against fat people is a thing that exists, and is a thing that is popular. And I understand why it is popular. If I could write the universe a check for $1,800 to avoid fat-shaming for the rest of my life and to receive better, non-fat-shaming healthcare, I would consider that a good deal. That makes me so sad, when I weigh the prejudice I experience as a fat person against a dollar amount I would spend for a Get Out Of Prejudice Free card. And it makes me sad that vultures like The Biggest Loser (and really, I feel, the bulk of the for-profit diet industry) are happy to peddle that impossible dream to people desperate for some peace and quiet and decent health care. * I noted this in my previous Biggest Loser post, but for people who have joined us since then, the show has a harmful history of deeply unhealthy behavior, such as encouraging contestants to become dangerously dehydrated in order to lose weight.